Approaching the middle of May and well into the Arctic sea ice retreat we can see that the sea ice extent (area of ocean with at least 15% sea ice) is still well below the mean over the satellite record. 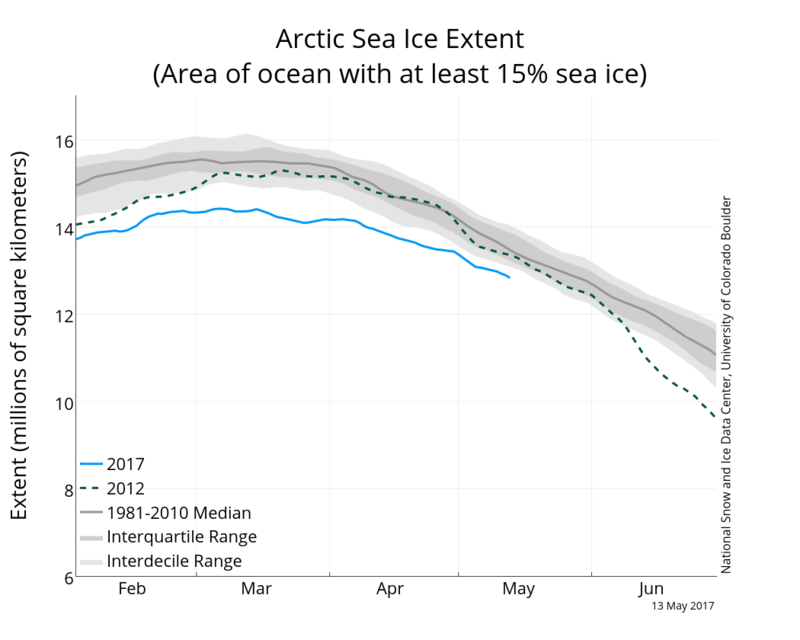 Arctic sea ice extent to 53 May 2017 from NSIDC. I like a geographic perspective, so this is the mean sea ice extent 1989-93 on 13 May, the sea ice extent 13 May 2017, and the difference between the two data sets. Reds imply less sea ice than the mean 1989-93, and blues an increased sea ice extent. The mean Arctic sea ice for the years 1989-93 on 13 May, the sea ice concentration on 13 May 2017 and the difference between the two data sets. Blue shades imply more sea ice and reds imply decreased sea ice compared with the mean. The original data come from the DMSP SMMI data set at the NSIDC. There appears to be a general trend of the Arctic sea ice edge retreating between the two data sets, but I think this is in places meteorological - that is the winds are compressing the sea ice. I think this because there is a lot of blue (i.e. more sea ice than the 89-93 mean) just north of the sea ice edge. The Bering Sea appears relatively sea ice free at this time. 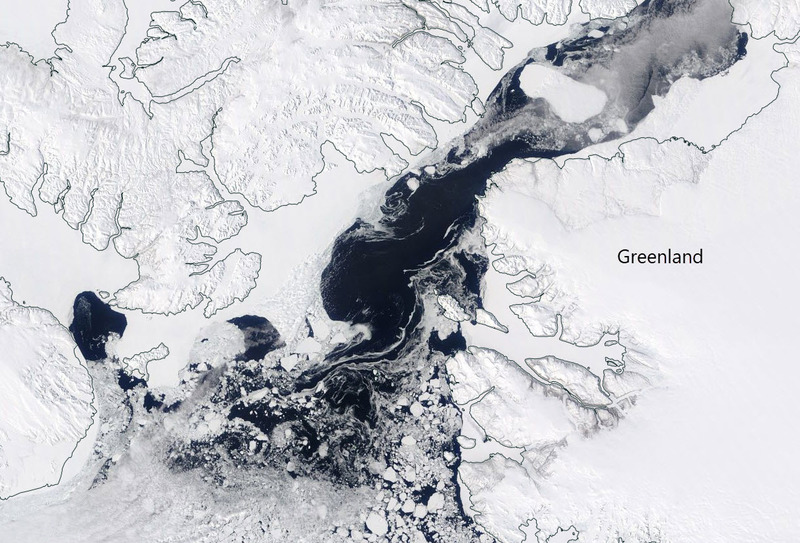 On the North West of Greenland you can also see that the North Water Polynya has opened up. The location of North Water polynya. Image from MODIS data 14 May 2017. When you zoom in you can see the open water. 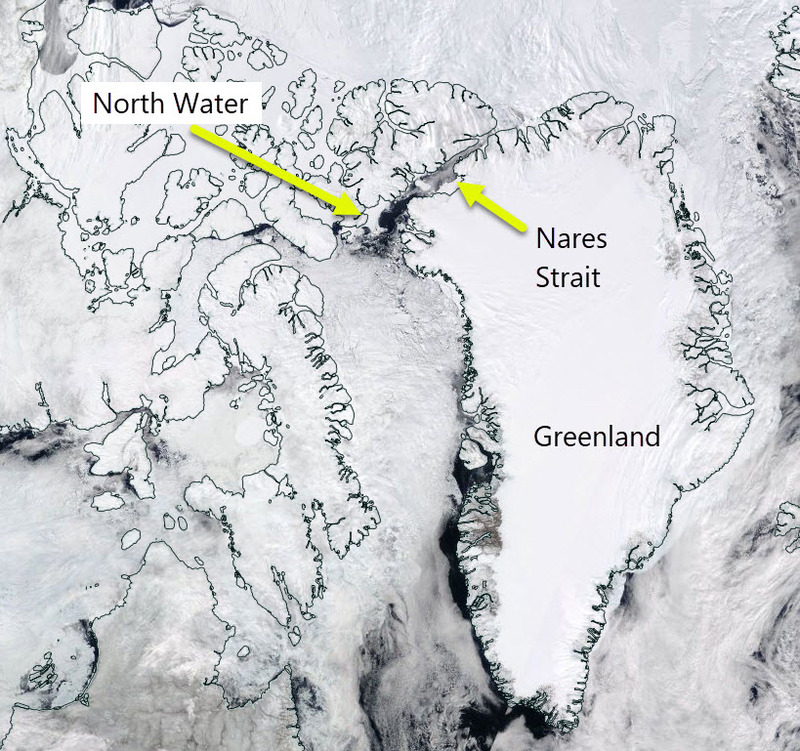 North Water polynya. Image from MODIS data 14 May 2017. North Water is a very famous whale habitat and as the light increases we may see a plankton bloom here. Posted in Science. Tags: 2017, Arctic, Bering Sea, North Water, polynya, sea ice on May 15, 2017 by Mark Brandon.